"Lemon of Troy" is the 24th episode of The Simpsons' sixth season. It originally aired on the Fox network in the United States on May 14, 1995. In the episode, the children of Springfield wage war on Shelbyville after their beloved lemon tree is stolen from them by Shelbyville children. "The First Amendment does not cover burping". The living room is shown in black and white; the Simpsons come in, resembling smiling cartoon characters from the 1930s, and do a stiff dance. It was written by Brent Forrester and directed by Jim Reardon. For the episode, the animators designed a non-polluted version of Springfield. It features cultural references to the 1984 song "When Doves Cry", the 1981 film Mad Max 2, and the 1968 song "What a Wonderful World", and the title of the episode is a play on the name Helen of Troy from Greek mythology. The episode acquired a Nielsen rating of 8.1. After Marge lectures Bart on the importance of town pride, he realizes how wonderful it is living in Springfield and becomes upset with anti-Springfield sentiments coming from the neighboring town of Shelbyville. Grampa explains that this rivalry can be traced back to the establishment of the two towns. The next day, Springfield's lemon tree is stolen by a gang of boys from Shelbyville. Taking his town pride to heart and swearing to keep it, Bart leads Milhouse, Nelson, Martin, Todd, and Database into Shelbyville to search for the tree and bring it back to Springfield. Eventually, the Springfield children track down the tree to an impound lot where the leader of the boys that stole the tree lives. Back in Springfield, Homer, using Ned Flanders' RV, leads the men to find the boys. When the two groups meet, the boys tell their fathers of the tree being stolen. At the impound lot, the men demand the return of the tree, while the owner of the impound lot refuses and taunts them. Using a plan similar to the Trojan Horse, Bart steers the RV to the outside of a hospital. The RV is taken to the impound lot after it is found parked outside the hospital. When night falls, the Springfield boys and their fathers get out of the RV and tie the tree to the top. They are caught in the middle of this act by the owner but manage to escape, and the tree is returned to Springfield. In the aftermath, old men in both Springfield and Shelbyville provide their own endings to the tale. In Springfield, Grandpa tells of the triumphant return of the tree by the heroes of Springfield, to which Bart and Milhouse celebrate with a glass of lemonade (from a few drops of lemon juice, and a whole lot of sugar) and the kids of Shelbyville drink turnip juice, much to their disgust, having made up a story about the tree being haunted to cover the embarrassment of losing to their rivals of Springfield. 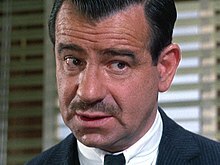 The voice of Shelby's father is based on Walter Matthau. Brent Forrester wrote "Lemon of Troy", his second episode of The Simpsons. Jim Reardon directed it. Early on in the production stage, the writers decided that the leader of the Shelbyville children, Shelby, and his father should be modeled after Bart and Homer. Shelby's voice was provided by Tress MacNeille, and Shelby's father was voiced by Hank Azaria, who based his performance on Walter Matthau as Dan Castellaneta originally based his performance of Homer on Matthau. The writers wanted to have the Springfield children find an area of Springfield that was not decimated, and the animators designed a version of Springfield that was very idyllic. They drew several scenes of the children running through non-polluted streams and woodlands. The animators gave Shelbyville's nature a more dark feeling in comparison to Springfield. In the episode, Milhouse recites a slightly paraphrased line from Prince's 1984 song "When Doves Cry". Bart identifies the number seven in Roman numerals by referring to a nonexistent sequel of the Rocky film series, Rocky VII: Adrian's Revenge. The scene with Bart and his team sitting on a hill above the enemy camp and looking down at the captured tree being circled by children on bicycles bears a resemblance to an early scene in Mad Max 2. The method of recovery of the lemon tree is a reference to the legend of the Trojan Horse. The overall plot structure of Springfield residents attacking their neighboring rivals after they steal their prize possession is a reference to the legend of the Trojan War, in which the incentive for the Greeks declaring war on their Trojan neighbors is the abduction of their most famous and beautiful female citizen, Helen. The title of the episode is a play on her name. 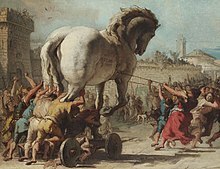 The method of recovery of the tree is an echo of the Trojan Horse. In its original broadcast, "Lemon of Troy" finished 55th in the ratings for the week of May 11 to May 17, 1995, with a Nielsen rating of 8.1. The episode was the sixth highest rated show on the Fox network that week. Since airing, it has received many positive reviews from fans and television critics. Matt Groening, creator of The Simpsons, called the episode a "classic" and said it is one of his favorites from the show. Warren Martyn and Adrian Wood, the authors of the book I Can't Believe It's a Bigger and Better Updated Unofficial Simpsons Guide, said there was "some nice ideas in this episode—Bart and his chums all have near-doubles in Shelbyville—but this is a strangely pedestrian outing, and seems hidden away—wisely—at this point in the season." In a DVD review of the sixth season, DVD Verdict's Ryan Keefer said the episode "easily [is] one of the best of the season" and that it has "gotten more enjoyable since it first aired". He added that the episode is "full of everything that makes the show successful" and gave it an A rating. ^ a b c d Martyn, Warren; Wood, Adrian (2000). "Lemon of Troy". BBC. Retrieved 2008-03-28. ^ a b Groening, Matt (1997). Richmond, Ray; Coffman, Antonia (eds.). The Simpsons: A Complete Guide to Our Favorite Family (1st ed.). New York: HarperPerennial. p. 175. ISBN 978-0-06-095252-5. LCCN 98141857. OCLC 37796735. OL 433519M. .
^ a b c Groening, Matt (2005). The Simpsons season 6 DVD commentary for the episode "Lemon of Troy" (DVD). 20th Century Fox. ^ a b c Reardon, Jim (2005). The Simpsons season 6 DVD commentary for the episode "Lemon of Troy" (DVD). 20th Century Fox. ^ a b c d Mirkin, David (2005). The Simpsons season 6 DVD commentary for the episode "Lemon of Troy" (DVD). 20th Century Fox. ^ Gareth Huw Davies (May 2, 2004). "Linger At A Quiet Spot And You Can Conjure Up A Hero". The Mail on Sunday. Retrieved on September 23, 2008. ^ a b "NBC Continues As Top Network". Associated Press. May 18, 1995. p. 4E. Retrieved on September 22, 2008. ^ Keefer, Ryan (August 29, 2005). "DVD Verdict Review - The Simpsons: The Complete Sixth Season". DVD Verdict. Archived from the original on December 25, 2008. Retrieved 2008-09-26. Wikiquote has quotations related to: "Lemon of Troy"
"Lemon of Troy episode capsule". The Simpsons Archive.